We are only four weeks into the Winter 2016 season, and I’m fairly confident I’ve already found my favorite short of the season, and potentially the entire year. What I am talking about is a little four episode short from CoMix Wave Films called Tabi Machi Late Show that is part of this season’s Ultra Super Anime Time block. Each of the episodes are stand alone tales that touch upon various aspects of life and the relationships that people form along the way. Due to the nature of the show, I’ll give a brief look into each of the episodes, while trying to remain as vague as I can so not to spoil anything. The first episode focuses on a young Japanese chef-in-training, Nagi, as he sits down for one last meal with his teacher and inspiration, Azuma, before he sets off for Italy to further his training in Italian cuisine. During their meal, Nagi reflects on his time spent with Azuma, while Azuma thinks back to the man who she looked up to and learned cooking from. This episode is one many young adults can relate to, that moment they leave the nest to go live their lives and further their careers. This is the most blatant episode when it comes to dealing with simply saying goodbye, yet at the same time, it is a bit hopeful, as Nagi and Azuma departing doesn’t have an air of finality to it, more like a, “Until we meet again!” kind of thing. This one is the emotional gutpunch on the series, and for many people, it is their favorite. That group includes me, by the way. “Summer Festival” is, buckle up people, all about dealing with the loss of loved ones. It takes place during the Obon festival, where the spirits of the dearly departed return to the realm of the living briefly. It follows a pair of kids named Haruka and Yukari (who are either really close friends or childhood crushes, can’t really tell) who attend the festival. Except...one of them is dead and uses this time to have a bit of fun with the other before they dissipate back to the ether for another year. It’s a bittersweet episode and shows us a glimpse at a kid dealing with the death of another. The final episode follows an elementary school teacher named Sakurada as she looks back on her life and career of teaching for 37 years. She never fell in love, never gave birth to children of her own, instead dedicating her life to her students. Yet she is not presented to be some kind of spinster or someone who regretted her choices in life. She is proud of the fact that she has seen students come and go for nearly four decades, with her goodbyes to each class sending them off to the next stage in their lives. Seeing Sakurada-sensei’s tale made me reminisce about all the teachers that had impacted my life for the better while I was in school. Each episode in Tabi Machi Late Show is expertly written, with the show being carried almost entirely by its writing. That’s not to say the show is visually bad, it is in no way, shape, or form a bad looking show. However, it is decidedly not the usual CoMix Wave work, replacing the insanely gorgeous visuals of say a Makoto Shinaki film, with something that looks more like a motion comic. Character movements are more like a sequence of still images with the most active movement being the characters’ faces. 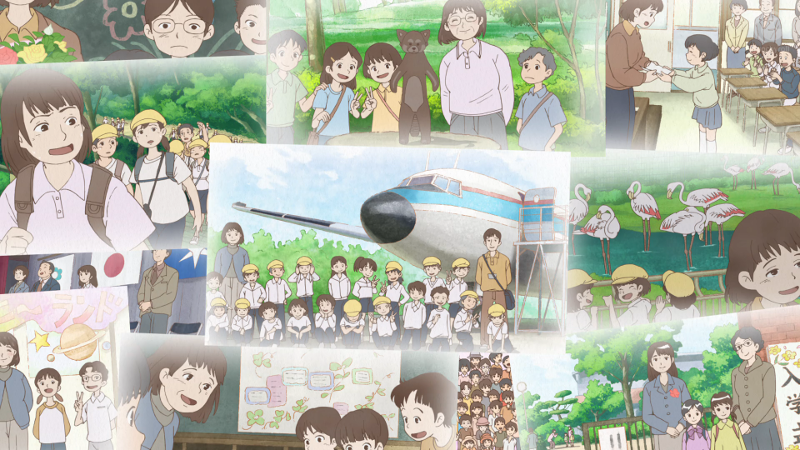 However, this does not mean Tabi Machi Late Show is a crappy low budget production (though the limited movement and short run time of course made for a lower overall cost) as this was clearly a stylistic choice that, when combined with the sepia and water color look of everything, gives the entire show this air of nostalgia to it, like everything shown were memories. Point is, what I am trying to say is do not let the show’s woefully low MAL rating fool you. This is a high quality show, and is by far the biggest gem of the season so far. In my 2015 favorites article I said Kagewani was the kind of experimental shows I wanted to see from the Ultra Super Anime Time block and I had hoped to see more come from the block. Little did I know that the very next season would deliver another wonderful show in that mold. I implore all of you to give this show a chance if you haven’t already. All it would cost you is 24 minutes of your life. Trust me, this is one thing you won’t regret.